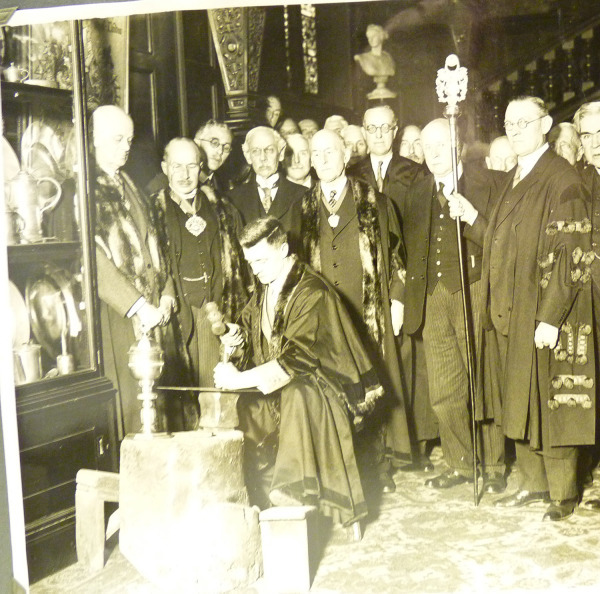 The Company's earliest records show that its members attended every year at the Austin Friars Monastery..
dated 1348 when the “goodfolk, makers of vessels of pewter” came before the Mayor and Aldermen asking for approval of the Articles which they had drawn up for the regulation of the trade. The history of the Company reflects that of the use of pewter. King Edward IV granted the first charter in 1473/4. This gave the Company the right to be self-governing, to hold goods and property in perpetuity and to govern the trade throughout the kingdom. This is unlike the powers granted to the majority of other companies whose jurisdiction was limited to the City and its environs. Arms were granted to the Company at the same time. Groups of tradesmen naturally congregate to discuss matters of mutual interest. Since in feudal times any gathering was considered suspect by the authorities, companies usually had a religious affiliation. Ours was to the Virgin Mary, and her symbol, a lilypot, appeared in our original arms. This was changed in 1533, during the Reformation, when the one in present use was granted. 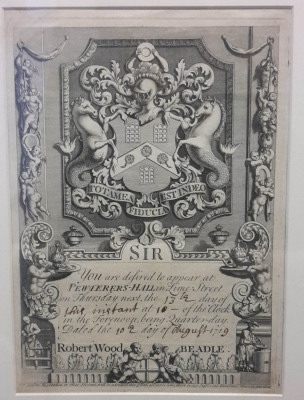 The Company was concerned with trade matters, costs, prices, raw materials, quality of pewterware and training of apprentices, as well as relief to the poor within the trade, funeral expenses, general charity and civic duties. 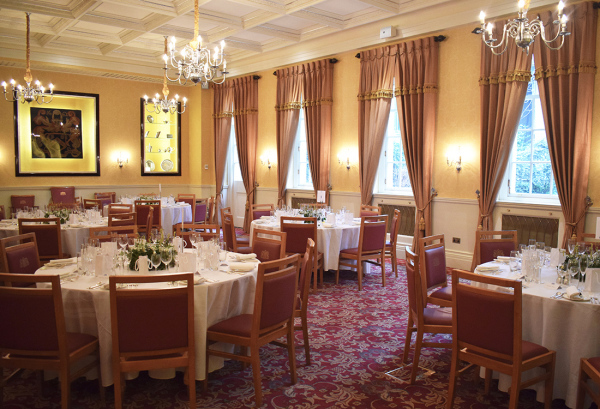 The Company continues to support the trade, charities and the City as well as meeting together in Pewterers' Hall. containing over 1,000 individual marks and are of great historical value. A new touch plate was introduced in March 2000. The prosperity of the trade may be said to have reached its zenith in the late 17th century. Thereafter, partly because society's drinking habits changed following the introduction of tea to this country and partly because the industrial revolution introduced new techniques and the use of alternative materials, the trade steadily declined. By the late 18th century the number of those in the Company who actually followed the trade was small. 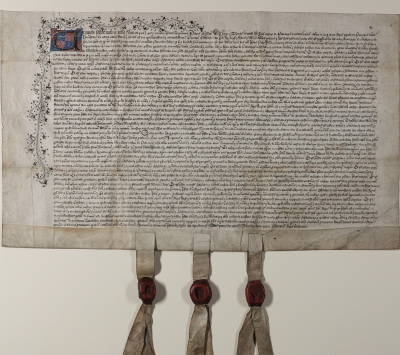 The First Charter granted by King Edward IV on 20th January 1473. This document gave licence to three Pewterers (the Master and Wardens at the time), Piers Bishop, William Large and Thomas Langtoft, to found to the honour of God and of the Virgin Mary a fraternity or perpetual Guild of the Master, two Wardens and Commonalty of the Freemen of the Mysteries of Pewterers. 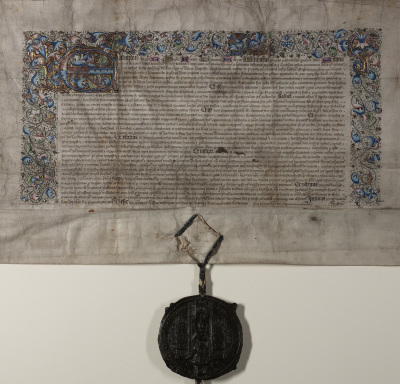 The following Royal Charters were subsequently granted to the Company, most of the originals or facsimiles of them hang on the walls of the Hall: - by Henry VII in 1504, by Henry VIII in 1513, by Philip and Mary in 1555, by Elizabeth I in 1585, by James I in 1606, by Charles I in 1638, by Charles II in 1673, by James II in 1685 and by Queen Anne in 1702. The Charters gave the Company legal substance and provided a framework for its governance. 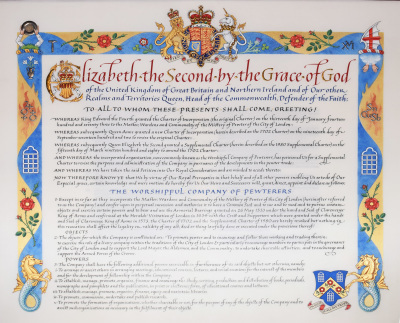 This was not always straightforward and from time to time the Company’s Charter was revoked by the issue of a Writ of quo warranto or forfeited, most recently under Charles II in 1684. Hopefully, matters are now less complicated. The new Charter was granted to the Company in February 2016 and came into effect when it was sealed in September 2016. The earliest record of Arms in use by the Company is dated 1451. These first arms include a representation of the Assumption, recalling the Company's origin as a Fraternity in honour of the Virgin Mary. The Pewterers, as other Livery Companies, found it politic to eliminate religious symbolism during the Reformation: in 1533 new Arms were therefore granted, followed, forty years later, by the crest, supporters and mantling. 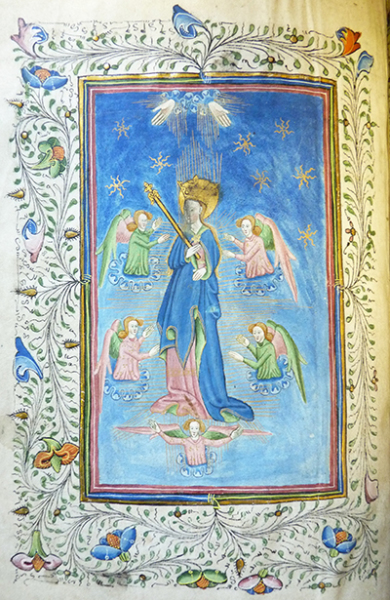 Depicted, below, is a beautiful Illumination in a book, known as the Jury Book, used for swearing in officials and new members, and was presented to the Company by Robert Chamberleyn (Master in 1458 and 1466) and his wife, Cicily, in 1463. The Chamberleyns also gave to the Company three election Garlands or Chaplets in red satin with tassels and on one of them two strakes and an image of the Assumption of Our Lady in silver. More recent copies of the Chaplets (which we now call Crowns) are still used to this day on the installation of the new Master and Wardens at the Crowning Court in September. (usually taken to be 18th August) there would be a celebration and church service in All Hallows, Lombard Street, but this came to an end in 1546. The original Seal of the Company acquired at the same time as the first Charter in 1473 depicted lily pots which was a device borne by the Craft in the arms in honour of the Virgin Mary. This too was changed at the time of the Reformation and now, instead of lily pots we have roses. The roses were included in the Arms because the Rose, or Crowned Rose, was one of the emblems of the Virgin Mary and therefore a device suitable for the Brotherhood of the Assumption. At that time this emblem, and its association with the Craft would be recognised on the Continent; it was therefore used as a stamp or touch to indicate “London Pewter” on exported pewterware. Hence the much used Crowned Rose touchmark. 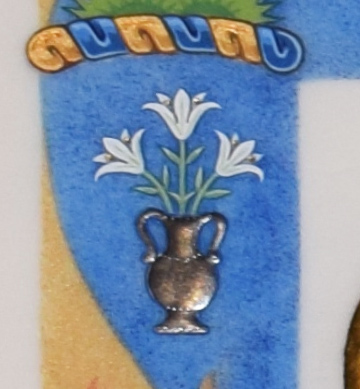 Below: detail of the lilly pot on the new Charter. for training in their respective trades. 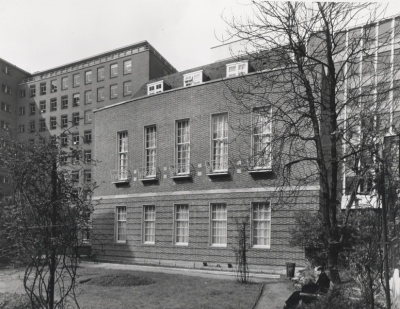 The First Hall: The Company's earliest records show that its members attended every year at the Austin Friars Monastery on the Feast of the Blessed Virgin; after doing business in the Offices, a feast was held in the Hall of the Monastery. 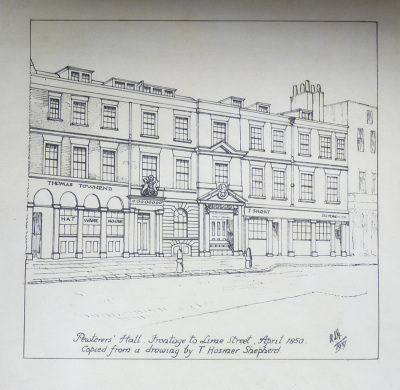 Very soon after receiving its first Charter the Company looked for suitable premises for its own Hall and in 1484 acquired a site in Lime Street, which it still owns today. A Hall was completed in 1496 and provided a centre for business and recreation, having both a garden and a vinery. It was a source of pride to its owners, being the centre of their trade government and of their social life. 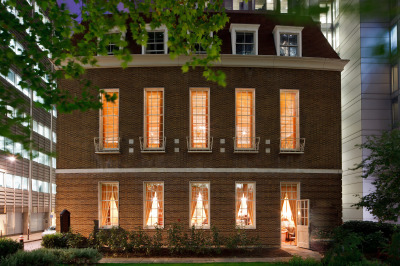 The Hall, as much other Company property, was destroyed in the Great Fire of 1666. The Second Hall: A second Hall was completed on the same site in 1670. It was recently discovered that the elaborate panelling in the second Hall, from 1667, was advised on by Sir Christopher Wren. 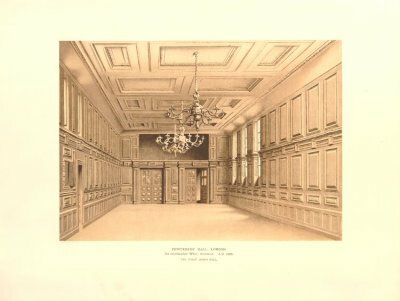 A print of the Great dining Hall with the panelling in place is in the collection of the British museum (see gallery, right). The second Hall also had elaborate plaster work and beautiful brass chandeliers. 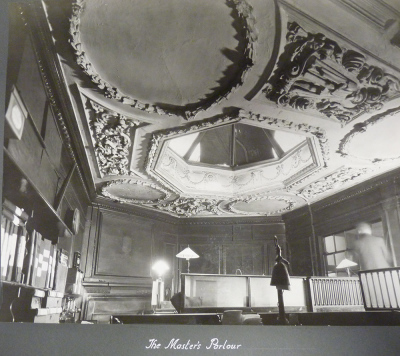 The original panelling and chandeliers were installed in the current Hall. 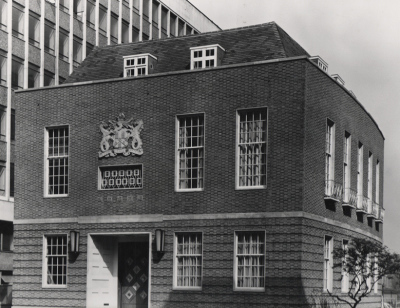 Like many other Livery Halls at the time, it was let occasionally to Protestant dissenters, as well as for dancing, fencing, funerals and meetings. However, usage declined slowly and the Company last dined there in 1801, other activities being transferred to one of the houses fronting Lime Street. Sadly there was a fire in 1883, the Cook had turned on the gas and hadn’t been able to light it; the Beadle lit a match which caused the explosion! After the fire there was no attempt to repair the Hall and it was demolished in 1932. 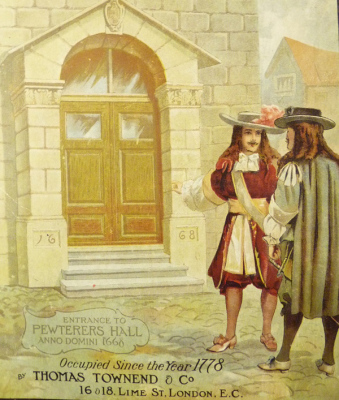 Pewterers' Hall 1668, London. Print from the collection of the British Museum. The Third Hall:​​​​ After the demolition of the second Hall the Company was effectively ‘homeless’ for almost 30 years. During this period the Company would continue to dine at various venues as they had during much of the 19th and early 20th centuries. 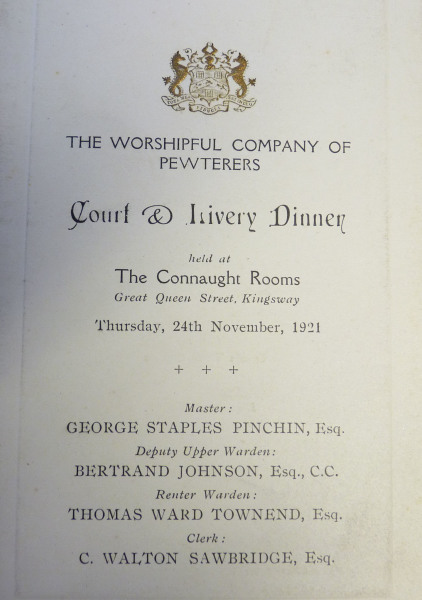 The Company still has several menus for these dinners such as the one pictured below (and as background) from 1921. To give some idea of the devastation inflicted on the City of London during the air raid over the night of 29/30 December 1940 more than 24,000 high explosive bombs and 100,000 incendiary bombs were dropped. For this reason the raid was dubbed the ‘Second Great Fire of London’. Many Livery Halls were gutted and the medieval Great Hall of the City’s Guildhall. All in a period of twelve hours. A turning point in Britain’s optimism and desire for change was the Festival of Britain in 1951. Even though Materials and labour were still in short supply innovative design meant that the City could re-build during the 1950s and 60s including the Pewterers'. 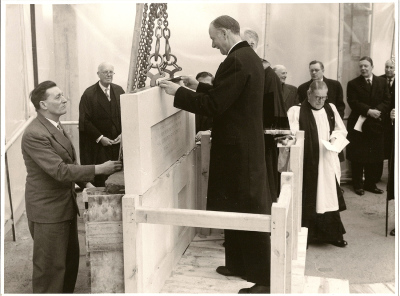 Sir Edmund Stockdale, the Lord Mayor, laying the foundation stone of Pewterers’ Hall . 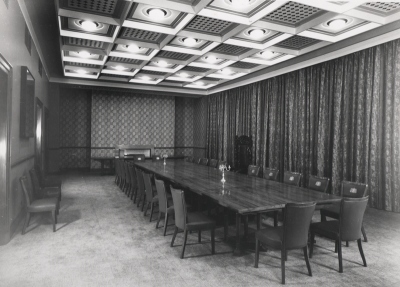 ​The current Pewterers’ Hall was built in the 1960s by Holloway Bros. to a design by D E Nye & Partners. The Hall was built in a classical style with Georgian high ceilings, a curved side and paned sash windows. However, it also utilised new materials and styles. Afromosia wood was used as a lighter alternative to mahogany, which was difficult to import at the time. Winston Churchill actively encouraged importing materials from the Commonwealth of which Nigeria was a supplier of Afromosia. John Hebert won the Furniture Makers’ Guild award in 1960 for his use of Afromosia in furniture, pioneering sleek modern design. Afromosia’s durable nature made it similar to teak and it is still in use in the Hall today. Geometric prints were used on wallpaper and curtains giving economical fabrics a modern twist. Glass and metal are used extensively on the staircase allowing light to stream through the building. The Curved wall on the Eastern side was a hark back to Georgian design. Past Master, William Grant, recalls a feeling of great pride at having a Hall again. His father Stanley Grant can be seen in picture above. 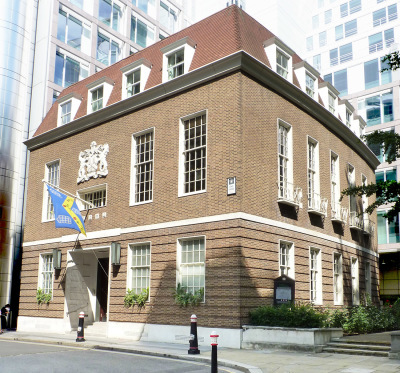 His father’s comment was that a Livery’s Hall is its ‘Home’. Thanks to its original design Pewterers Hall is a functional space which lends itself to different events. 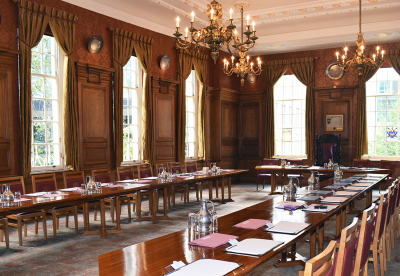 Right the Livery room today.